My mom makes unbelievable cran-apple pie. It’s not very common. I’ve never seen it offered in a restaurant, and we’re all aware how much I like to eat. The tartness of the cranberries is an excellent pairing to crisp apples. In honor of Mother’s Day, I thought I’d share something from my mommy’s kitchen to yours! Blend together sugar and flour in a small bowl. Place pie crust in bottom of a 9″ pie plate. 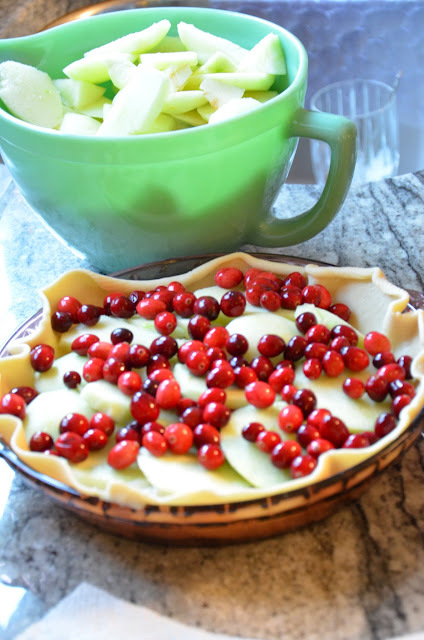 Alternate layers of apples, cranberries, and sugar mixture, beginning and ending with apples. Dot the top with small pats of butter. Put on top pie crust and crimp edges. Cut slits through the top crust to allow steam to escape. Use a pastry brush to brush top crust with egg water mixture.